Scope: Poster, Logo, Publication Design, Illustration, Advertising, Typography and Packaging. He had 5 lectures in Iran and Turkey since 1998-2000. Also there are written 73 articles in non-Iranian magazines about him. Foundation of Graphic Faculty in Tehran University, teaching in Universities, member of Jury of Graphic and Animation Exhibitions in Iran and Europe countries, was of his activities. 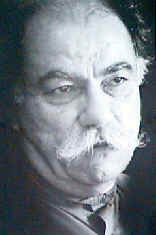 He has won a number of prizes for his works.